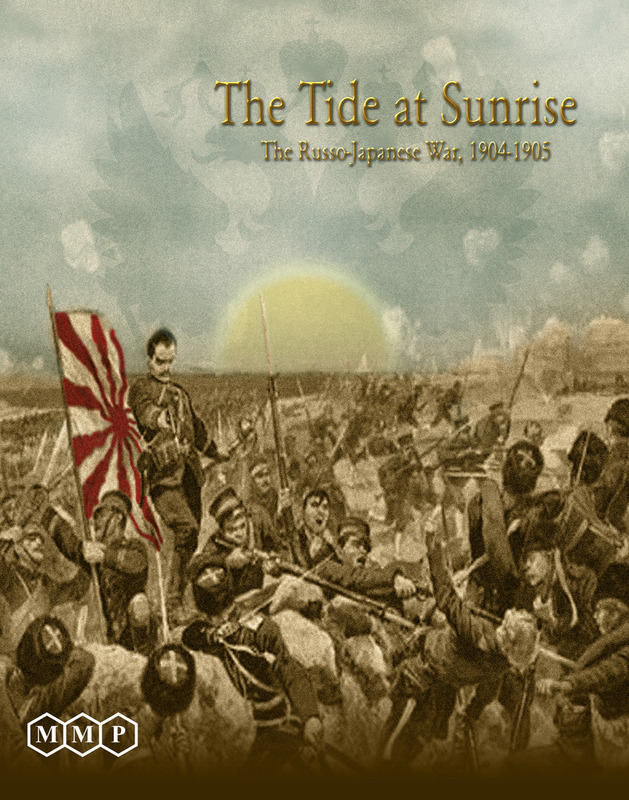 Designer: Yukihiro Kuro and Adam Starkweather Publisher: MMP (2010) A few years ago Multi-Man Publishing© issued The Tide at Sunrise in its International Games Series (IGS), this one from Japan on the Russo-Japanese war 1904-1905. 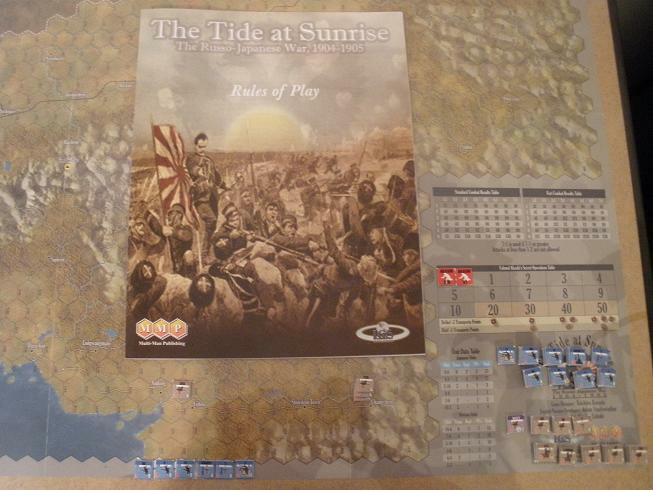 The Tide at Sunrise simulates the ground war between the two countries over Russian controlled Manchuria. The naval aspects of the war, so critical to Japan’s ability to sustain the ground campaign, is abstracted with a Naval Combat table die roll to resolve possible sorties by the Russian fleets in Port Arthur and Vladivostok. Ground units are division or brigade strength. There are only about a dozen Russian units on the board as the game starts and the Japanese enter from Korea on turn 1. Each side uses Transport Points to bring reinforcements into play or build up replacement points used to reinforce and supply units that suffer “Disorganized” results in combat. Units that are eliminated are permanently removed from play and award Victory Points to the opponent. Each side has a fixed number of Transport Points available each turn. That number may be reduced by Russian naval actions (Japanese Transport points being lost) or Japanese espionage and weather (Russian Transport points being lost). There are 12 game turns, each represents a month of time from April 1904 through March 1905. The Japanese player must accumulate 70 victory points in that time to claim victory. There are 70 victory points worth of objectives on the game board, so the Japanese will either have to drive the Russians from the map or eliminate more enemy units than they lose to achieve that goal. The burden of attack is on the Japanese. Their 1st army enters from Korea on turn 1 and must attempt to force their way across the mountains that stretch between Korea and Manchuria to attack the major cities on the other side of the mountain. Each turn they may also use their Transport Points to land new units along the coast to reinforce existing attacks or create new threats. If the Port Arthur fleet is capable of a sortie, then the Japanese reinforcements will be limited to the Southeast coast of the Liaodong peninsula. Once the Port Arthur fleet has been damaged or destroyed, either in combat or by the capture of Port Arthur, the Japanese will be able to land forces on the Northwest coast of the Peninsula and use the ports along that coastline for supply. The Japanese Transport capacity is at its peak as the battle starts, starting at 16 points and falling to 8 by turn 11. Russian naval sorties from Vladivostok and/or Port Arthur has the potential to reduce the Japanese Transports on a turn by turn basis. The Russians need only delay the Japanese advance without losing too many units to achieve victory. They have very few units to cover a lot of ground in the early going, and their Transport capacity starts low. It gradually builds during the game but is subject to losses from weather or Japanese espionage. The Russian commander must determine how much force to send against each Japanese threat to delay them and avoid taking excessive unit losses. The Japanese will usually isolate Port Arthur and the fleet on turn 2, so the Russian player must decide how much manpower and replacement points to allocate to the port defense on turn 1 with the Japanese 1st army advancing from Korea. Once both players are familiar with the game a turn will usually take no more than 15 to 20 minutes. The game played the full 12 turns will usually be played to completion in 2.5 – 3 hours. 1. Naval Phase (skipped on turn 1) – The Russian player has two fleets, the major one based at Port Arthur and a smaller fleet at Vladivostok. Should either of these fleets sortie, 2d6 are rolled and the result of the sortie is determine on a CRT. The results vary from various levels of defeat of the fleet (either awarding VPs to the Japanese or leaving that fleet unable to sortie for one or two turns) to the loss of Japanese transport points for the upcoming turn. About 2/3 of the counter sheet that comes with the game includes naval units which are not used in the standard game. There is a set of optional rules that are available from the publisher for a more detailed treatment of these naval sorties. In addition to the possible loss of Japanese Transport points for the turn, there are VPs awarded for naval operations. 2. Japanese Reinforcement Phase (skipped on turn 1) – The Japanese player uses his transport points available for this turn to purchase new units or to stockpile replacement points. New units will be placed along the coast at the start of the Movement Phase and replacement points used later in the turn to refit disrupted units. 3. Japanese Movement Phase – Reinforcements arrive by amphibious landing (or at a controlled port) and all Japanese units capable of movement may move. One very important note here is that disrupted Japanese units may not end this phase in a Russian Zone of Control. Any disrupted Japanese units that end the movement phase in a Russian Zone of Control are eliminated prior to the Combat Phase. 4. Combat Phase – Japanese conduct any and all attacks and the retreats or pursuits of each combat. Combat is not mandatory versus adjacent units, and while all defenders in a single hex must be attacked, attacking units are not obligated to attack ALL enemy units in their ZoC. 5. Supply Phase – Japanese player determines the supply status of all Japanese units. Units out of supply are disrupted and already disrupted units that are out of supply are eliminated. 6. Recovery Phase – Disrupted Japanese units that are in supply and not in an enemy ZoC may use available replacement points to remove their disruption. 1. Russian Transport Phase – The Japanese player rolls 1d6 and adds these die rolls over the course of the game to the “Colonel Akashi’s Secret Operations Table”. As the total builds up there are increased chances of reducing the Russian Transport points for the turn. If it is a Winter Turn (turns 8 – 12) then another 1d6 is rolled to see if bad weather reduces the Russian Transport total for the turn. 2. Russian Reinforcement Phase – The Russian player uses his available Transport Points to purchase new units or stockpile replacement points. New units are placed into or adjacent to one of the four reinforcement cities if the railroad from that city can trace LOC to the hex where the railroad enters the board. 3. Russian Movement Phase – All Russian units capable of movement may do so. All disrupted Russian units that end the movement phase in a Japanese Zone of Control are eliminated prior to the Combat Phase. 5. Supply Phase – Russian player determines the supply status of all Russian units. Units out of supply are disrupted and already disrupted units that are out of supply are eliminated. 6. Recovery Phase – Disrupted Russian units that are in supply and not in an enemy ZoC may use available replacement points to remove their disruption. The burden of attack is upon the Japanese in this game. They start with 0 VPs and have 12 turns to accumulate at least 70 VPs. There are a total of 70 VPs for occupation of terrain available on the map, but the Japanese are almost certainly NOT going to secure them all against a reasonable Russian defense. To collect 55 VPs from terrain would be about the best case scenario. There are a few VPs available from the destruction of the Russian Port Arthur fleet, which comes about either during the naval phase or with the capture of Port Arthur. The rest of them will come from the elimination of Russian units. Each Russian unit eliminated adds VPs to the total. Each Japanese unit eliminated subtracts VPs from the total.As a general rule divisions are worth 2 VPs and all other units are worth 1 VP, so the Japanese must plan on eliminating about 10 more divisions than they lose. The Japanese start with no units on the board and the Russians start with very few units in play. The Japanese transport capacity is at its maximum as the game starts and slowly declines from a maximum of 16 points to 8 points. 16 points is about 4 divisions. The Russian Transport capacity starts at 10 and builds to 16. The Japanese must use this early advantage in transport points to create more threats than the Russian can counter, then exploit whatever opening develops. The picture at the right shows the Changbai mountain range that runs from the tip of the Liaodong peninsula along the border between Manchuria and Korea. The Yalu river is just off the lower board edge, which is where the Japanese 1st army will be entering. They must push through the four Russian brigades that defend the rivers, destroying them if possible, and capture one of the seven passes through the mountains. The most direct route is through Fonghuangcheng toward the Motien or Yangzih passes. There are three possible passes through the mountain here and the Russian will have to stretch their defense to properly defend all of them. The mountains will protect their left flank as they advance, while a smaller force with the cavalry should be sent off to the right to block the road into the mountains at Saimajun. A secondary threat can be created by landing at the port of Dagushan and driving for the Fenshuai pass. This pass is very restricted and the Russians don’t need a lot of troops to block it, but it has the benefit of being very close to the coast, where Japanese reinforcements can land at Dagushan and be at the gates of the pass on the same turn they landed. The final pass through the mountains is further south, but because it exits the mountains south of Yingkou it rarely of any use to either side. The Russian forces will usually build their defense of Liaoyang no further south than Yingkou. This is due to the fact that the defeat or destruction of the Russian fleet at Port Arthur would free the Japanese transports to land Japanese reinforcements along the West coast. A brief explanation of the naval situation is in order here. As long as the Russian fleet at Port Arthur is capable of conducting a sortie, Japanese reinforcements cannot land West of Nanshan. The threat of a Russian naval sortie prevents Japanese supply from being traced to any port beyond that point. However, the Russian fleet at Port Arthur must sortie at least every other turn to maintain this threat. Should the Russian fleet decline to sortie two turns in a row, or should it be damaged or defeated and unable to sortie, then the Japanese can land reinforcements anywhere along the coast. As the results of a sortie are resolved with a die roll, neither side can know when the Japanese might secure this advantage. The Russian Port Arthur fleet must sortie on turn 3 to keep the Japanese reinforcements confined to landing north and east of Nanshan, but a defeat could see the Japanese landing at Yingkou on turn 4. If the Russian fleet was only damaged and not defeated, Japanese supply from that coast may well be a temporary situation. Still, with Japanese troops now behind the mountain the Russian defensive line is compromised and the rules for tracing supply are so lax that it will be difficult to put them out of supply given the few Russian units available for action the first few turns. This choice of where to land their reinforcements each turn and their axis of advance is the great driving force that gives this game so much replayability. The objective is to bring as much strength to bear along the railroad from Liaoyang toward the map edge as quickly as possible, eliminating as many Russian units as possible and losing as few Japanese units as possible along the way. However, the Japanese player has little room for error, as it takes way too long to redeploy units from one axis of advance to another. Units that move toward Liaoyang are simply going to have to force their way through those passes, while units directed toward the Fenshuai pass are going to have to force their way through there. This could be a very difficult battle if the Russians decide to commit their early reinforcements to these areas. The Russians have the benefit of the railroad behind the mountains and their reinforcements arrive very close to the front lines, giving them the benefit of interior lines. However, Russian units committed to the defense of the mountains are units that are not defending elsewhere. Which brings us to the main stay of the Japanese strategic plan. Isolating Port Arthur and moving up the railroad from that direction to turn the Russian right flank. Home to the main naval threat to the Japanese operation, Port Arthur lies at the end of this peninsula. If the Japanese navy does not defeat the Russian navy, then the Japanese army will have to capture Lushun to eliminate this threat. There are 25VPs of cities and 7 VPs of units on this peninsula, which is almost 50% of the total the Japanese need to win. The capture of the port and the elimination of the defenders is required for a Japanese victory. The question is…when? As long as the railroad that runs north from Nanshan remains uninterrupted by Japanese Zones of Control to the entry hex for Russian reinforcements, the Russian player can simply transport reinforcements directly to Port Arthur. This is a double edged sword. Every Russian unit sent there will probably be eliminated for VPs, but it will require a greater commitment of Japanese forces for success. The longer the port holds out, the longer these Japanese forces will not be available for attacks in Manchuria. The Russian player may either assign replacement points each turn to the general pool or to the Port Arthur garrison. In addition to sending in reinforcements, as long as the railroad is not interdicted the Russian player can accumulate replacement points at Port Arthur. 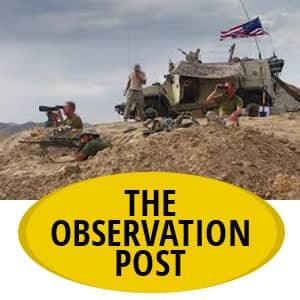 Once isolated from the entry point for Russian reinforcements, the Port Arthur garrison will be allowed to use the replacement points stockpiled there to refit disrupted units. Again, the more replacement points at Port Arthur the longer it is likely to take to reduce the garrison and capture the port. The gateway to Port Arthur is held by the fort at Nanshan. Using only infantry, the Japanese can attack from only 2 hexes. Stacking limit is two divisions/hex with two brigades equal to one division. This is usually enough to get 3:1 odds against the four brigades the Russian defenders have in the area that can stack in Nanshan. If the Russian player uses some of his first turn transport points to send in a division as a reinforcement, then the Japanese are only going to be able to achieve 2:1 odds unless they bring up some artillery support. The Japanese have some 28 cm siege guns in their force pool, but these guns are only made available on turn 7 or if an attack against a Russian controlled fort fails. If given the chance to attack the fort, even at relatively poor odds, the Japanese may well want to try it if only to make the 28 cm siege guns available. The road along the Bay of Korea coast leads to the port of Houershi, which serves as the supply port for the Japanese after landing. It is 2 hexes from this port to the railroad, so units that arrive there can move toward Nanshan or North to threaten the flank of the Russians defending the mountains. It is a long way to Liaoyang along that route, but movement along the railroad is only 1/2 MP for each hex once controlled, so rapid progress can be made unless the Russian player sends units forward in a delaying action. It is possible for the Japanese to send a blocking force to Nanshan while sending additional forces up the railroad to threaten the Russian units in the mountains. The Russians can rail in their own reinforcements, so Japan must be careful not to underman this operation. Every so often the Japanese player will split his forces and leave one of them weak enough to allow the Russian to counter attack and inflict disorder results or even surround and eliminate Japanese units. The workhorse of the Japanese army are their 9-8 divisions. There are 13 of them and in general you want to group them into armies of 3-4 divisions. That means the Japanese can organize only 3 or 4 significant threats. It takes 4 Transport Points to bring them into play, 2 replacement points to refit a disorderd division and their elimination will cost you 2 VPs. There are 17 x 4-8 regiments that are available starting on turn 3. They are well suited to protecting flanks and providing lower value combat units to disorder on an exchange result against Russian brigades. Of the other brigades, there are very few and they are all precious. There is only one 120 mm artillery unit, two 75 mm artillery and four 280 mm siege guns. These guns can support an attack from one hex away and often provide those additional combat points when you can’t bring more units adjacent to the defenders. The 10 factors of the 280 mm Siege guns makes them the ‘bunker busters’ of the game, but their movement allowance of two usually keeps them close to the railroad. Artillery must be protected since any disruption result they incur eliminates them. Probably the most precious are the cavalry units with their 10 movement points. There are only three of them and their loss would be keenly felt when the main battles begin West of the mountains. Their role is rarely to be used in combat, except against lone enemy brigades. Advance after combat for infantry is two hexes, but cavalry may advance (pursue) 3 hexes, which may allow them to surround other enemy units prior to their combat. Eliminated units are out of the game, they do not return to your force pool. You cannot use Transport Points to return them to action. 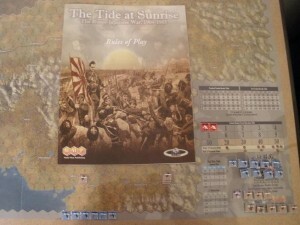 The successful Japanese player will avoid losses as much as possible to preserve units and do his best to avoid disrupted results, as the Transport Points used as replacements are not being used to bring new units on to the map. Certainly losses are to be expected, but the opening turns must be used to develop the situation and create opportunities, forcing the Russian player to react to your moves. Properly done, the Japanese must attempt to not only threaten the capture of significant victory point sites, but isolate and destroy a significant number of Russian units. The Russian strategy is simply to foil the Japanese strategy. The Japanese will advance from Korea and their control the Bay of Korea allows them to land their forces anywhere along that coast. You will have to do your best to preserve what few forces you start with and properly employ your very limited reinforcements to counter Japanese deployments. Time is on your side, as Russian reinforcements accelerate and Japanese transport points decline through the course of the game. You will be giving up space for time, and you have a lot of space you can give up. You must delay the Japanese advance long enough to build up enough units to form an effective defensive line behind the mountain ridge. The key to successful Russian play is to fall back just fast enough to preserve most of your delaying units while collecting strong units around Lioayang or Mukden. As the Japanese approach your position, look for opportunities to attack and destroy some parts of their army before they bring up reinforcements. The units coming through the mountains will not be able to support each other, so it may be possible to defeat the enemy in detail as they approach your position. The Russian player should always be on the look out for an undermanned Japanese operation. If they attempt to screen Port Arthur with minimal forces, consider an attack out of the fort to disrupt the defender. If they send only a brigade to threaten a pass, consider a counterattack to hit them. A 3:1 attack has a better than even chance of disrupting enemy units. The Japanese cannot afford to leave his units disrupted for any length of time, and every transport point used to refit disrupted units is one less point being used to bring on new troops. In general, Japanese units are faster than the Russians, so they have a lot more mobility, but you have the railroad. In addition to their reinforcements, each turn the Russian player can move two units any distance along controlled rail lines, then use 1/2 of their movement points to continue movement. Often your reinforcements will appear on the railroad at Liaoyang, then move along the railroad to a point where they can fill a hole or support an attack. Again, be careful that you protect your flanks in the event of a reversal. The Japanese will be looking to eliminate Russian units for VPs and his reinforcements can arrive along the coast at a bad time. Don’t allow a general battle to build too early, as the early Japanese transport advantage may well allow him to defeat you in detail. Only on turn 1 can you be assured of a secure rail line to Port Arthur. The reinforcement phase of turn 1 may well be your only sure opportunity to reinforce this position. Unless your forces along the Yalu river at the start have been eliminated, it is usually a good idea to use all 10 Transport points available on turn 1 to build up this defense. One option is simply to build up 10 replacement points in Port Arthur. If you have disrupted forces retreating from the Yalu river it may be a good idea to retain a few replacement points to remove the disruption from these units at the end of the turn. Another option is to build two divisions and send them to Nanshan. These 14 factors stacked at Nanshan present a formidable defensive front, but the lack of replacement points makes the defense brittle. One important consideration of this defense is that the Japanese may not bring on any of the 280 mm siege artillery guns until either turn 7, or a Japanese attack on a fort space has failed. This is a compelling reason to deploy forces in front of Nanshan, to delay any possible Japanese attack on the fort for as long as possible, at least until turn 6. If given the chance the Japanese player my make a low odds attack the fort with the plan of making the 10-2 siege guns available as early as possible. There is a price to pay, since the minimum odds for an attack are 1:2, the Japanese would have to risk a 9-8 division for this with a 50% chance of an AE (attacker eliminated) result. As the Japanese commit more units to improve the odds, they reduce the chance of having a unit eliminated, but even at 5:1 odds the fort combat table still has a 50% chance of disrupting the attacking units. The more Japanese units disrupted, the more Transport Points they will have to use to refit them, which will delay the arrival of new units. One other consideration is that all the units that start on the peninsula may not move on turn 1. The only units available for operations on turn 1 are reinforcements or the two units that started around Lioayang may use railroad movement to reach this area and assist in the defense. I can’t say I recommend sending the units from Lioayang there, since any unit sent to the peninsula is quite likely to find itself stuck there once the Japanese land on turn 2. The first half dozen turns the Russians will have many threats to counter and putting too much emphasis on one area invites the Japanese to exploit a weakness elsewhere. There are two Russian fleets available for duty. A small fleet of cruisers at Vladivostok and the main battle fleet with Battleships at Port Arthur. The key fleet is the Port Arthur fleet, as their ability to sortie is what prevents the Japanese from sweeping around to the West coast and landing units there. A supplied Japanese bridgehead near China at Yingkou would turn the flank of the Russian position along the railroad. Russian forces would have to fall back a considerable distance to avoid being crushed between this force and Japanese units coming over the mountains. This would be combined with a precipitous retreat of the forces on the East side of the mountains before they are cut off and isolated. The Japanese would be able to link up their forces far too early and quite likely deliver a crushing blow before the Russians can bring on enough forces to fight them effectively. The Vladivostok fleet should sortie every turn allowed. It is only available on turns 1-7 as the port is frozen and the fleet locked in for turns 8-12. Most of the time a sortie by this fleet will have no effect. A successful sortie will reduce Japanese transport points by 2 for the turn, a defeat will prevent the fleet from making a sortie for a turn or two and a disaster will see the fleet eliminated with 2 VPs awarded to Japan. The Port Arthur fleet must be preserved as long as possible, but must also sortie to keep the Japanese at bay. It does not have to sortie on turn 2, but does on turn 3 to prevent the Japanese from landing reinforcements beyond Nanshan that turn. The results of the sortie range from a victory that reduces the Japanese Transport Points by 50% that turn, to a defeat that damages the fleet and prevents it from conducting a sortie for one or two turns, or even a disaster that eliminates it and awards 5 VPs to Japan. Due to the sortie the Japanese will not be allowed to land forces beyond Nanshan on turn 3, but if the fleet was damaged or defeated they will be able to land there on turn 4. It happens more often than you would like (about 1/3 of the time) so be prepared to adjust you defense accordingly. As long as the situation on the ground benefits from keeping the Japanese landing along the coast beyond the port, the best defensive plan is only to sortie the fleet to maintain the situation, which would be every other turn. If the situation is such that it doesn’t matter, sortie the fleet at every opportunity in an attempt to reduce Japanese Transports. There is a 1/3 chance of a successful sortie that reduces their transport capacity by anywhere from 2 points to 50% of their points for the turn. The fleet will be lost if Port Arthur falls, so it’s best to at least try to use them usefully. The Russian player starts with no divisions on the map, only a collection of brigades. There are a pair of 5-2 brigades in the Port Arthur garrison. They are the two strongest brigades in the game, but may not leave the three hexes of the Port Arthur fort. The 3-6 brigades and 3-10 cavalry units that make up your field army are no match for the 9-8 Japanese divisions that you will face. At every opportunity they should fall back and find a blocking position that slows the advance of the Japanese and prevents them from being surrounded. The rough terrain and mountains help, but these units are very vulnerable in open terrain. The Russians have two types of divisions, the 7-6 Eastern divisions which are available at the start of the game and the 10-6 European divisions which are available starting turn 3. Like the Japanese divisions, the 7-6 divisions require 4 Transport Points to enter, 2 replacement points to refit and their elimination gives the Japanese 2 VPs. There are only 10 of them available, and they will be your strongest defensive unit for the first two turns. The 10-6 divisions cost 6 Transport Points to enter, 3 replacements to refit and their elimination awards the Japanese 3 VPs each. There are 15 of them available, but it is unlikely you will get them all into play at a cost of 6 Transport Points each. Russian Transport capacity does not reach 12 until turn 4, and you will still be bringing on the Eastern Divisions and cavalry support troops until later. These units are the bulwark of your main defensive line. 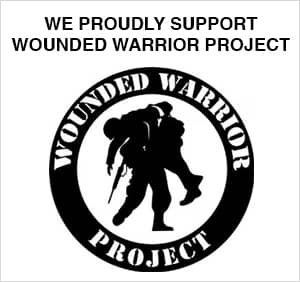 Make sure they have enough support troops with them to prevent the Japanese from surrounding them. All brigade level units have the same parameters of the Japanese brigades. 2 Transport Points to enter, 1 replacement point to refit and are worth 1 VP if eliminated. All of the 3-6 brigades and 5-2 garrisons start the game on the board. Three of the cavalry units start on the board and seven more are available as reinforcements. Their primary use will be to counter the actions of Japanese cavalry units and enemy brigades. Late in the game they will be used to join battles where their ability to advance 3 hexes after combat could be very useful. There are only 2 artillery units available to the Russian. Surprisingly, the additional combat factors these units can provide on the offensive while being two hexes away often are a big deal and can gain an odds table. Like the Japanese artillery, they are eliminated if disrupted so they should usually be brought on late in the game where they can safely support attacks behind a beefy line of 10-6 European divisions! The Japanese 1st army (shown at left) will enter from Korea at the start of turn 1. The Russian garrison at Port Arthur may not move at all on turn 1 and there are two Russian brigades at Liaoyang, far from the Korean front. The Russian player has 3 infantry and 1 cavalry brigades from the East Siberian army for the defense of the Yalu river and is free to set them up as he wishes along the west bank of the Yalu river. On 22 April 1904, General Alexi Kuropatkin dispatched the “Eastern Detachment” under the command of Lieutenant-General M.I. Zasulitch with 16,000 infantry 5,000 cavalry and some 62 artillery pieces to fight a static delaying action on north bank of the Yalu river. Unlike General Zasulitch, we will not under estimate the Japanese army and know that our primary goal is to save our forces while retreating toward the mountain passes and a better blocking position. The Japanese must capture a pass, as they cannot trace a supply line over the mountains and would otherwise be quickly out of supply. Combat units are subject to “Disrupted” results in battle, which reduce both their combat values and, for the Russian, their movement points. Disrupted units lose their Zone of Control and are eliminated if they end their movement phase in an enemy Zone of Control. Since the Russian player will want to make a maximum effort to supply Port Arthur for the expected siege, the Eastern Detachment is unlikely to get any replacement points on turn 1 and is expected to hold back the Japanese without reinforcement for the first two turns. It will come as no surprise to most of you that an essential element of our defense is an understanding of the movement rules and the possible combat results. All undisrupted units exert a Zone of Control (ZoC) into all adjacent hexes. The sole exception to this rule is that Japanese units do not exert a ZoC into Russian fort hexes. Units must stop movement when they enter an enemy ZoC, which is vital to the Russian defense. Any unit that is not disordered will stop the movement of an enemy unit that moves adjacent. A very significant rule is that combat is voluntary, so an attacking unit may attack one unit while ignoring other enemy units in its ZoC. A successful attack allows the victors to pursue, ignoring enemy ZoC in the process. Infantry pursues up to 2 hexes, cavalry up to 3 hexes. Artillery may only advance into the battle hex if it attacked while adjacent. Artillery will usually be bombarding from longer range (1 hex between the artillery and the target), which allows it to avoid any negative combat results and allows more ground units to move up and attack. The Russians have a total of 12 combat factors available for defense. The Japanese army has a total of 40 combat factors for the attack. There will be a one odds column shift down to benefit the defenders due to the river, which is negated by the one odds column shift up the Japanese receive for the first turn attack. The Russian would gain an additional column shift if defending in a rough terrain hex as well as a shift for a town hex. A single Russian defending unit can be attacked at 7:1, which assures the Japanese of victory and not taking any losses. Two 9-8 divisions and the 75 mm artillery has the 21 combat factors necessary for this. Given that a victory would be assured the cavalry might want to join in for the pursuit opportunity. If the defending unit survives it will be disrupted, making escape difficult. If the Russian puts two units into a hex for a total of 6 combat factors, the Japanese can get no better than 6:1 odds by using 36 factors to attack. This is still a very favorable attack, as the defender will either be eliminated or retreat. There is a 1/6 chance of a DR result where the defender will retreat but NOT be disorganized. There is a possibility of an EXR (Exchange Retreat) result, which means the Japanese would have to disrupt units of equal or greater combat value, so a 9-8 division would have to be disrupted, but the undisrupted victors could conduct pursuit. Three Russian units in a hex provides a defense of 9 factors. The best the Japanese could do against this force is a 4:1. This means that the Russian units cannot be eliminated unless they are foolish enough to allow the enemy to surround them. There is a 1/3 chance that they will simply retreat two hexes in good order. Since they can retreat to different hexes, there is strength in numbers as they could disperse to limit the ability of pursuit to get around them. The down side of this odds column is the possibility of an EX result. This would disrupt all three Russian defenders, while the Japanese would need to disrupt only a single 9 factor division. Worse, the Russians hold their ground! On their turn they must exit the Japanese ZoC, and with their reduced movement rates they are going to be hard pressed to escape. This is one of those instances where the failure to secure a retreat result is probably a disaster for the Russian. The stacking limit for both sides is two divisions, with two brigades equal to one division. Assuming the flanks are secure, the Russian could put all four units into a single hex for a defense of 12 factors. The Japanese will be able to get no better than 3:1 odds against this stack. This is actually a less preferable column to use on the CRT than the 4:1 column, as it replaces a DD result with another EX result and increases the possibility that the Russian forces will hold their ground. A solid defensive position is hex 0432, just Northeast of Andong. While not in rough terrain, it blocks all the roads out of Korea and greatly hinders Japanese movement. The Japanese can bring a 4:1 attack against this hex. They will survive this attack, but there is a 2/3 chance that they will be disrupted. On the EX result they would not only be disrupted, but they would not retreat. Things can get very dicey as they attempt to run north toward the passes. There is a 50% chance of disrupting a Japanese division, but there is also a good chance that the Russian units will not escape. Note that the brigade in 0434 may be there to block the road to the north and hinder Japanese movement further, but this unit could be the downfall of the Russian defense! The Japanese simply ignore the main defense stack, place on 9-8 division in 0332 and attack the single brigade with the rest of the Japanese army. These 31 factors can attack at 7:1 and the cavalry would be able to pursue all the way into 0533, surrounding the main Russian force. They could attack the Japanese cavalry and drive it off, but would almost certainly be surrounded by the infantry on the following turn. An improvement would be to move the brigade one hex over to 0435. This deployment still blocks the Japanese cavalry from getting through the line. An alternative is to deploy the cavalry far to the north, say hex 0440, where it could move up the road to block the pass at Saimajun. The Japanese initial move can get the cavalry no further than 0534, so the Japanese will not be able to surround them and will do no better than 4:1 odds for their initial attack. Excellent review, you are tipping the scales for me to get the game. I really appreciate the time you took for such an outstanding description.